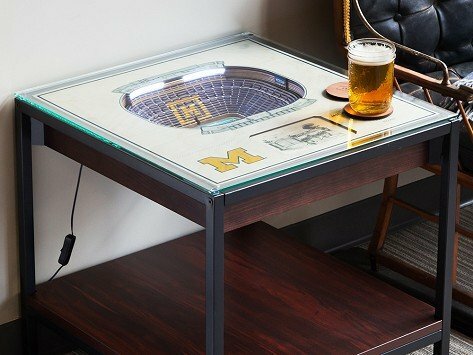 Please allow up to 2 weeks for shipping on orders for StadiumViews End Tables. 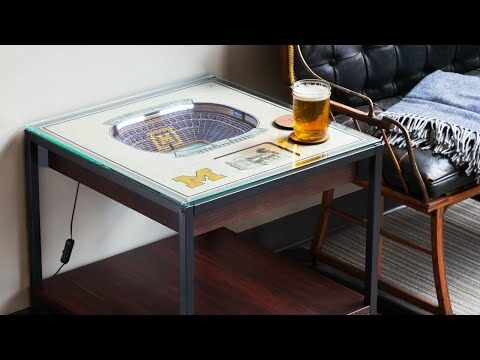 This lighted end table makes a glowing addition to your den, game room, or fan cave. Twenty-five layers of real wood are hand assembled in Indiana to create a three-dimensional work of stadium art that pays tribute to some of the most famous (and beloved) professional and college sports stadiums in the USA. LED lights that specifically match the actual lighting of the stadium and details (like field lines and facts about the stadium) finish off these designs that are sure to be a fan favorite. Dimensions: 22" x 23.5" x 22.5"
Whether you’re an NFL fanatic or want to honor your alma mater, StadiumViews has a 3D stadium replica. They’ve captured an aerial view of hundreds of professional and college team stadiums. And every piece is Made in the USA. They focus on catching all of a stadium’s details from a blimp’s perspective. From the seats to official logo, everything is represented on precision-cut pieces of white birch and poplar wood. The pieces are layered to create the three-dimensional effect.